This will be a review of two products that are sold together and designed to work with one another, EC Research TriLASTIN-SR Maximum Strength Stretch Mark Cream with Hydro-Thermal Accelerator. This product is designed to work on all stretch marks regardless of their age and to stop new ones from forming. It can be used on all skin types and colors and will smooth and even skin tone. Read onward to find out more about this product’s ingredients and our opinion of it. 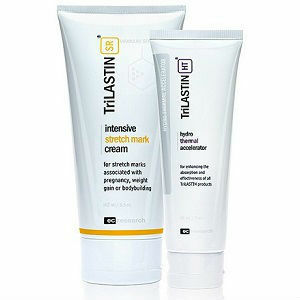 The ingredients in TriLASTIN-HT Hydro-Thermal Accelerator causes the pores to open and contains an agent that will enhance penetration of the product when it binds with TriLASTIN-SR. TriLASTIN reduces the visibility of stretch marks by encouraging collagen and elastin to regenerate in the skin, which causes the skin to thicken and hide the scarring. Vitamins E, C, B3, B5 and B6 nourish the skin. The skin is also detoxified and made firmer by these ingredients. This product contains soy, which is an allergen. These creams are Paraben-free. The products should be used twice a day. The area to be treated should be washed and dried and then TriLASTIN-HT should be applied. After waiting a minute, TriLASTIN-SR should be applied in circular motions until it is absorbed into the skin. If used as told, the tube should last between 4 and 6 weeks. EC Research did not name any adverse effects that their products might cause, which is perturbing as there is an allergen contained in their product. Although it is claimed that these products are hypoallergenic, soy is contained in them and could cause an allergic reaction. People with such an allergy may suffer from a rash in the exposed area or they may have a more severe reaction depending on the nature of their allergy. Anyone who experiences a reaction of any sort should consult with a doctor and stop using the product immediately. $79 covers the cost of a 5.5oz or 162ml tube of TriLASTIN-SR Maximum Strength Stretch Mark Cream as well as a 3oz or 89ml tube of TriLASTIN-HT Hydro-Thermal Accelerator and can be bought from EC Research directly. Ordinarily, TriLASTIN-SR Maximum Strength Mark Cream would cost $79 alone and TriLASTIN-HT Hydro-Thermal Accelerator would cost $19. A limited offer means that when you buy two TriLASTIN-SR with Hydro-Thermal Accelerator that you automatically get a third one free, which will be put into your cart for you. A tax of $4.74 is applied to the purchase of one product bought and so the total price for this is really $83.74. The flat rate for delivery is $6.95 for the USA. EC Research provides their customers with a 90-day guarantee. They will only accept returned products if they were bought from them directly rather than from another retailer. Products must be returned within 90 days of their purchase and they must carry an RMA that can be obtained from EC Research’s customer support department or through their website. A refund will only be given for the price of the product as the cost of shipping and handling will not be included. They offer replacement or exchange of products that do not satisfy the customer as well. These creams have received more than twenty customer reviews and seem to have satisfied most customers. This product is really two so the price is not terrible so it is fair value for money, if it works. However, a number of extra charges are included that are not readily specified by the manufacturer prior to purchase. Reviews and photographs concerning the use of this product seem to suggest that it is highly effective although it does not seem to work for everyone. For those who find that the product is not for them, they are left with ample time to try it and return it if dissatisfied with the results. It is difficult to judge the effectiveness of this cream based on the ingredients as the quantities of each are not mentioned. However, the ingredients do show that there is a potential allergen in this product, which contains soy and possibly soy-derived ingredients. These creams have been highly received by most people but that does not mean that they will work for you. David Carney	reviewed TriLASTIN-SR	on June 29th	 and gave it a rating of 3.5.